Survey results that will be posted in the March Update to the 20th anniversary 2017 edition of IC Insights’ McClean Report show that eleven companies are forecast to have semiconductor capital expenditure budgets greater than $1.0 billion in 2017, and account for 78% of total worldwide semiconductor industry capital spending this year (Figure 1). By comparison, there were eight companies in 2013 with capital spending in excess of $1.0 billion. 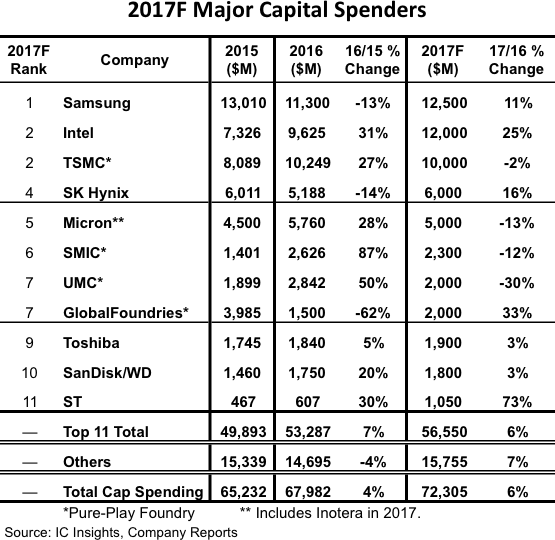 As shown in the figure, three of the top 11 major capital spenders (Intel, GlobalFoundries, and ST) are forecast to increase their semiconductor spending outlays by 25% or more in 2017. The biggest percentage increase in spending by a major spender in 2016 came from the China-based pure-play foundry SMIC, which ran its fabrication facilities at ≥95% utilization rate for much of last year. SMIC initially set its 2016 capital expenditure budget at $2.1 billion. However, in November, the company raised its spending budget to $2.6 billion, which resulted in outlays that were 87% greater than in 2015. In contrast to the surge of spending at SMIC last year, the weak DRAM market spurred both Samsung and SK Hynix to reduce their total 2016 capital spending by 13% and 14%, respectively. Although their total outlays declined, both companies increased their spending for 3D NAND flash in 2016. As shown, Micron is forecast to cut its spending by 13% in 2017, even after including Inotera, which was acquired by Micron in December of last year. In 2016, GlobalFoundries had plenty of capacity available. As a result, the company cut its capital expenditures by a steep 62%. As shown, the company is forecast to increase its spending this year by 33%, the second-largest increase expected among the major spenders (though its 2017 spending total is still expected to be about half of what the company spent in 2015). It is assumed that almost all of the spending increase this year will be targeted at installing advanced processing technology (the company announced that it is focusing its efforts on developing 7nm technology and will skip the 10nm node). After spending about $1.06 billion last year, Sony is expected to drop out of the major spender listing in 2017 as it winds down its outlays for capacity additions for its image sensor business and its spending drops below $1.0 billion. As shown in Figure 1, ST is expected to replace Sony in the major spender listing this year by increasing its spending by 73% to $1.05 billion. It should be noted that ST has stated that this surge in outlays is expected to be a one year event, after which it will revert back to limiting its capital spending to ≤10% of its sales.